On 6 April, the massive semi-circular formwork was removed— or rather ''gouged out''—of the bioshield wall. On the side of the ITER bioshield that faces the main ITER office building, four large openings have been preserved to allow passage for the neutral beam injection system and diagnostics. 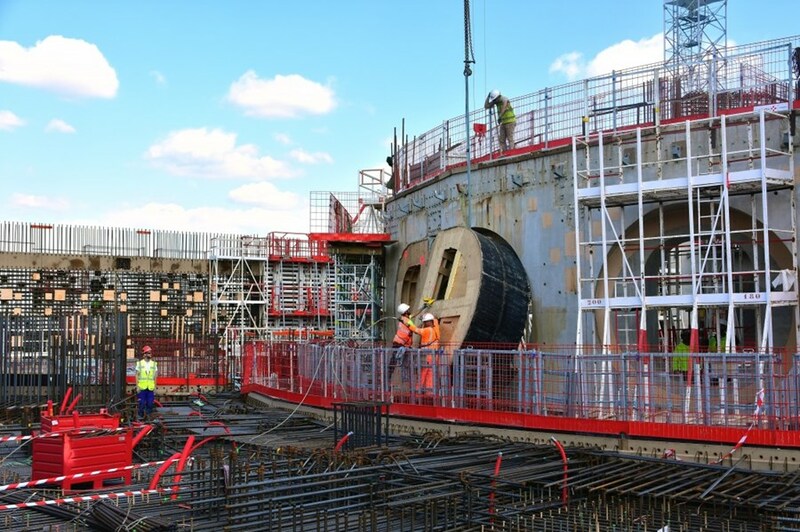 Following the pouring of concrete on 24 March, and two subsequent weeks of drying, the massive semi-circular formwork was ready to be removed on 6 April. Rather than cutting it and removing it in pieces, which could have damaged the concrete, the contractor chose to pull the formwork out with a powerful winch system that exerted a force of several tonnes. The operation was quite spectacular. In this photo, we can see the semi-circular formwork for one of the three openings as it has just been "gouged" out of the concrete wall.